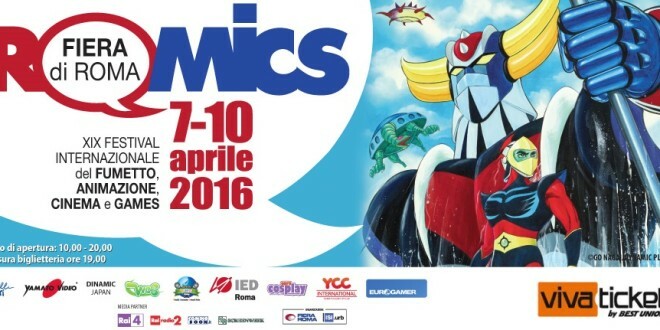 Now in its 19th Edition Romics is back, an International Festival for fans of comics, animation, movies and games. The festival has always a large number of participants who each year grow and are in addition to the faithful followers that do not lose even one of the two annual editions. The exhibition, divided into pavilions, houses in each of them the stand dedicated to industry news, publishing houses, comics, collectors, where you can buy gadgets and meet many authors and publishers but also special guests. Each year prizes are awarded to the Italian and international masters of comics, illustration and film through the delivery of Romics D’oro which this year will go to one of the greatest authors of comics and Japanese animation Nagai Kiyoshi, aka Go Nagai. To him we owe the birth of large cult 1980s cartoon heroes, which accompanied generations, including Mazinger and Grendizer. His creations are dealt with many issues including the struggle between good and evil and man’s relationship with science and technology. The works of Go Nagai have made school and influenced the authors of comics from around the world. There are still many who come to the discovery and rediscovery of the works of Go Nagai, from the 1970s to the most recent. The artist for forty years continues uninterrupted to make creations or to renew and rewrite its popular characters. The Romics, for all four days of programming, will celebrate his presence and will award the Romics d’Oro, whose assignment as usual will take place on Sunday April 10 10:00 a.m. 12:00 a.m. at the Pala Romics, Pavilion 8, Hall for big events and award ceremonies. Like every year the festival calls all the cosplayers to parade on the big stage of Romics. In fact, fans can create and wear the dress of their favorite character. This year there are many appointments and cosplay enthusiasts, besides the Romics Cosplay Award which provides for the winner a return ticket to Japan, the homeland of comics and cartoons. The Romics is present at the fair of Rome from Thursday 7 to Sunday 10 April from 10 to 20. The ticket offices are open from 10:00 to 19:00. The ticket on weekdays (Thursday and Friday) is 8 euros, while Saturday and Sunday is 10 euro. For over 70, military and children under the age of 12 years for all four days is 7 euro. A day pass for the cosplay is 5 euros, free for children under 5 years and invalids (with over 70% of disability) plus an attendant. Visitors can enter the festival from different entrances: the North entrance, South entrance, East entrance.